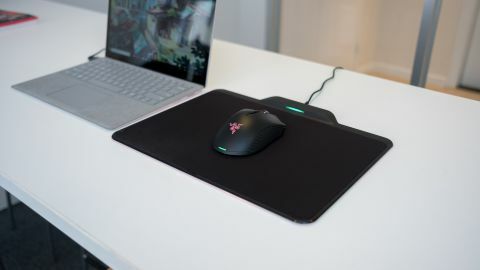 Razer might have set out to make the Razer Mamba Hyperflux the world’s lightest wireless gaming mouse but, without a battery, it’s tied down by its wireless charging mouse pad, putting the whole value proposition into question. Wirelessly charging mice are officially a trend now that the Razer Mamba Hyperflux is the third such peripheral to promise consistent and constant wireless operation when paired with a special ‘Firefly’ mouse pad. While it might seem like Razer is late to the game, the Mamba Hyperflux treads new ground by ditching any sort of internal battery in the name of being the world’s lightest wireless gaming mouse. The result is a wireless peripheral that basically can’t be used anywhere but on its mouse pad. That’s a tall order to ask of gamers, and the $249 (about £180, AU$320) price point of this wireless combo only makes it harder to rationalize as a worthy purchase. Although the Logitech G903 and its complementing PowerPlay mouse pad are also priced at $249 (£259, AU$449), it’s a far more compelling choice since you can use the mouse wirelessly on its own. Furthermore, spending $169 (£169, AU$299) on Corsair Dark Core RGB SE and its MM1000 Qi mouse pad is a comparative a bargain that also boasts the utilitarian Qi charging system. Unsurprisingly, the Mamba Hyperflux shares the most of its overall design with Razer’s flagship Mamba – save for a few features. The most notable difference regarding the Mamba Hyperflux is the lack of RGB strips running along both sides of the device. Good news is it still packs a decent amount of RGB with lighting built into the scroll wheel and the company logo. The Hyperflux version of the Mamba is also missing the Adjustable Click Force system, which would have allowed us to fine tune the amount of force needed to actuate the two primary buttons. Thankfully, it’s not something you’re really going to miss unless you loved the feature on the original version. Although minor, it’s hard not to look at all these omissions and not see the Mamba Hyperflux as a cut-down version of the original it was modeled after. At the very least, we can say the Mamba’s ergonomics haven’t suffered. The mouse’s overall shape is the same as its Hyperflux-less brethren, which should delight right-handed users – and might annoy everyone else. As with other Razer mice we’ve tested in the past, the tall frame and sloped back side make it incredibly comfortable for both a palm and claw grip. The Hyperflux also features large rubber grips with a long, wavy lined design reminiscent of the company’s more recent peripherals, including the Atheris and Lancehead. You also won’t find another wireless mouse lighter than this. Weighing in at just 96g, the Mamba Wireless feels light as a feather. Razer was only able to this after dropping the battery that would have otherwise added another 29g. Of course, dropping this crucial component also means the mouse has to either constantly draw power from its bundled mouse mat or be connected directly into other devices via USB. As mentioned before, the Firefly Hyperflux is the other half of this peripheral’s wireless charging package. This special version of Razer’s RGB mouse pad generates a small, localized magnetic field that the Mamba Hyperflux turns into a constant stream of energy through electromagnetic induction. Though the Mamba Hyperflux lacks a battery, it’s equipped with a super capacitor – an electrical component that stores and transfers electricity. You might think the peripheral like this would die the instant you lifted it off the pad, but it can actually hold a charge for five to 10 seconds, depending on how extreme your lighting effects are. Any more time than that, and it'll stop working, but dropping it back onto the charging mat will bring it back to life within a second or two. With this setup, you’ll still have to route a USB wire from the mouse pad to your PC, but at least you won’t need another port for the transmitter, because it’s actually built into the mouse pad. While this is good for cutting down on clutter and freeing up a USB port, it also means you really can’t use this mouse without the Firefly Hyperflux. Otherwise, the only other of way using this peripheral is connecting it directly to your PC through a USB connection – but this feels like it ruins the whole point of it being ‘wireless’. In this way, the Razer Mamba Hyperflux feels like a ‘wireless’ mouse intrinsically tethered to a USB charging pad. That would be fine for users who mean to only use it for gaming at home, but for the amount of money it costs, we would want a peripheral that we can take anywhere. The Corsair Dark Core RGB SE and Logitech G903, on the other hand, are completely competent wireless mice on their own that are then further complemented by their respective wireless charging mousepads. Electromagnetic resonance technology and all its novelty aside, the Mamba Hyperflux is another solid gaming mouse from Razer. At no point did we notice lag or watch our cursors suddenly spin out of control due to a wireless signal malfunction. Rather, the mouse was accurate to a pin point, thanks to its 16,000 DPI 5G optical sensor. Of course, it helps that Mamba HyperFlux works best on a pad specifically designed for it and PC gaming. The dual-sided mouse mat gives us a hard, slick surface on one side for rapid movements needed for navigating the wide maps in XCOM. Then, the soft pad comes in handy for games that require more accuracy, like pulling a dozen headshots in Nazi Zombie Army: The Trilogy. Despite everything Razer had to cut to get the Mamba to its sub-100g weight, we’re somewhat glad it did. Without a wire to add drag, you won’t find another mouse you can sling across the mousepad as quickly as this. Razer’s Hyperflux peripherals are a novel concept and they achieve everything they set out to do. However, whether these versions of the Mamba and Firefly are for you will depend on your PC gaming setup. If you’re totally cool with buying a wireless mouse and charging pad combo that you’ll never take outside, it might be a worthy venture. If it were up to us though, we’d rather spend our money on Corsair or Logitech’s more robust wireless solutions. Still, the capabilities of Razer’s wireless charging technology can’t come soon enough to the company’s other peripherals, like the Lancehead, and we hope Razer decides to keep the battery next time.